Ascend Physical Therapy & Wellness is pleased to offer Cold Laser Therapy (or Low Level Laser Therapy - LLLT) in addition to our traditional rehabilitative, preventative and wellness physical therapies! Cold laser therapy is a painless, sterile, non-invasive and drug-free treatment proven effective in treating a wide range of pain syndromes, injuries, wounds, fractures, neurological conditions and pathologies. 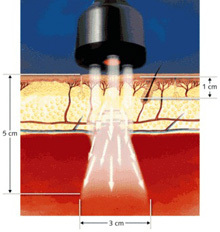 Cold laser therapy uses specific wavelengths of light to interact with tissue to help accelerate the healing process. If your therapist prescribes LLLT, you will find it quite passive with no pulsating sensations as you would expect with electronic stimulation, and no heat as you would expect with ultrasound. LLLT is excellent if you request or need a drugless procedure for the control of your pain and have found that conventional therapies were ineffective. It is also used when the acceleration of healing of injuries is desired. I tried other physical therapy treatments, exercises, injections, epidural injections, medicines, etc. nothing seemed to work. I am extremely pleased to inform you that the COLD LASER treatments Nancy gave me were a complete success; the pain has diminished almost completely. I am again able to do things that had become impossible for me to do before this treatment. Thank you for treating my chronic back pain!